Recent polls show that the ‘no’ vote for the constitutional referendum, which was slated for April 30 and then postponed indefinitely, is rising, however ‘yes’ still has over 50 percent support. 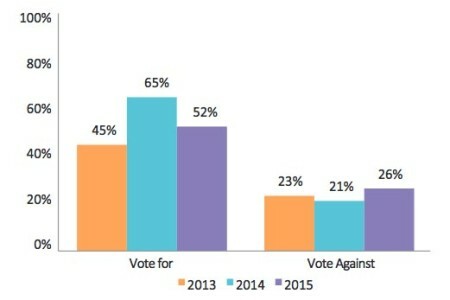 Data collected in January and February 2015 by Tanzanian civil society organization Twaweza shows that 26 percent of the population plans to vote ‘no’ — the highest figure since they began polling in 2013. The ‘yes’ vote has leveled out at 52 percent, up from 45 percent in 2013 and down from 65 percent in 2014. “For the ruling party, this is an important show of strength in an election year,” says the report. The poll also shows 75 percent of the population is against a referendum boycott called for by the opposition coalition, Ukawa. Twaweza’s findings revealed that while a majority of Tanzanians were aware of the referendum, less than 25 percent knew where to find a copy of the proposed constitution. The report also shows that the majority of citizens are optimistic that the upcoming October 2015 general election will be held under the new constitution. Earlier in April, Tanzania’s Prime Minister announced the April 30 referendum would be postponed indefinitely. A new date has not yet been set by the National Electoral Commission. Data from Zanzibar was not included in Twaweza’s report.